Russia's central bank governor Sergei Ignatiev has said that $49bn (£33bn) left the country illegally last year. The capital flight, some 2.5% of Russia's annual economic output, was controlled by "one well-organised group of individuals." Mr Ignatiev told a Russian newspaper that the money transfers could have been used to pay for supplies of narcotics, bribes and avoiding taxes. But a government spokesman said the figure was "highly exaggerated". "You get the impression that they are all controlled by one well organised group of people," Mr Ignatiev told local newspaper Vedomosti, although he declined to name the individuals. "With a serious concentration of efforts by law enforcement agencies, I think it is possible to find these people," he added. Mr Ignatiev said the $49bn figure was drawn from a central bank study that showed more than half the flows were made up of "dubious" capital transfers, "payments made by Russian organisations to non-residents, the stated aims of which are clearly false". "It can be payment for narcotics... illegal imports... bribes and kickbacks to officials (and) managers making large-scale purchases. It can be schemes to avoid tax," he added. 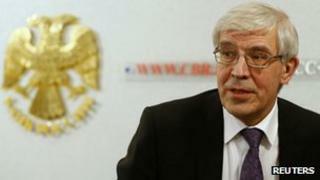 Mr Ignatiev, who is expected to step down in June after 11 years at the helm of the central bank, also highlighted the prevalence of what are known in Russia as "one-day companies" used as conduits for money transfers that then vanish before paying taxes. They are "the bane of our economy", he said. But Dmitry Peskov, spokesman for President Vladimir Putin, dismissed the central bank's findings, saying the figure was "highly exaggerated". A study by Washington-based Global Financial Integrity found that an average of $62bn in income earned from corruption, weapons smuggling, human trafficking, and other illicit activities has entered or left Russia each year since 2004. Alexander Lebedev, who owns The Independent and Evening Standard newspapers and is a frequent critic of the Kremlin, wrote in a blog that Mr Ignatiev's comments were long overdue. "Let's hope the next head of the central bank heeds these words," he said. However, Mr Ignatiev did not refer to the subject when he testified in front of Russia's upper house of parliament on Wednesday.